Formula, Equations, Theorems, Derivations, Rules, Protocols – We have them all around us guiding us. What to do? How to do? Where to do? When to do? Why to do? But, applying these formulas is not so easy. All of them do come with certain conditions, limitations and exceptions. If we ignore them, we will land up with wrong results. How about our life? Does it also come with a formula, a set of instructions, a collection of guidelines? Well, not exactly the mathematical formulas, but there are rules and protocols based on previous experiences. These are passed on from generation to generation based on the experiences of our ancestors. Now, have you ever played the “Chinese whisper” game? It is a game played around the world, in which one person whispers a message to another, which is passed through a line of people until the last player announces the message to the entire group. Errors typically accumulate in the retelling, so the statement announced by the last player differs significantly, and often amusingly, from the one uttered by the first. With this what I am trying to emphasize is that when the rules and protocols get passed on they differ significantly from the actual one. The most common flaw that stays is the inclusion of conditions and limitations. 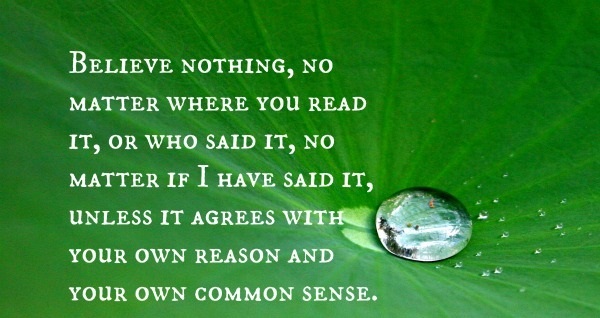 What may be a right step in one situation can prove to be a wrong step in the other. For instance, it’s good to help the needy and poor. But, doing so to lure them for votes and politics is wrong. Every rule is conditional. Many a times we follow the rules, but leave the conditions behind. We try to explore them to some extent. But, still there are lots of people who live their life without searching for answers to these questions. Instead of thinking, how we want to live our life, how we can decide what/when/where we can do, we just look at our parents, society, friends and colleagues. Instead of deciding our own path, and analyzing the pros and cons we just start moving on their path. We blindly follow all others. Is it the right approach? With this analysis, I am not trying to offend or dis-respect our elders. They do teach us good lessons and we have a lot to learn from their experiences. The only thing is, we shall understand the meaning behind every approach, every step. We shall follow the path shown by them, not just for the sake of following but for the sake of learning and understanding. We shall always be convinced of what we do. Being a blind follower takes us away from reality and satisfaction. There used to be a closed room with a big ladder. On top of the ladder there was a platform with bananas on it. Then, monkeys were left in the room. Location of bananas was shown to them. The room was closed and a camera was placed in the room. All monkeys approached the ladder. Some of them quickly started climbing and others were left behind. They, then tried pulling back the other monkeys climbing the ladder. The struggle continued and after a while some of the monkeys were replaced with new ones. Monkeys were replaced again and again. Every time, a new monkey entered, he started following the same activity. After a few more attempts, even the bananas kept on top was removed. The monkeys still continued climbing and pulling down. They just continued climbing looking at their previous counterparts. But, they are not aware of the motive behind it – Bananas. The motive was gone, but they all still continued the same activity. None of them bothered about why they are doing so? What will they achieve on climbing? This is what happens with most of us. We are not aware of the motive, circumstances and requirements. 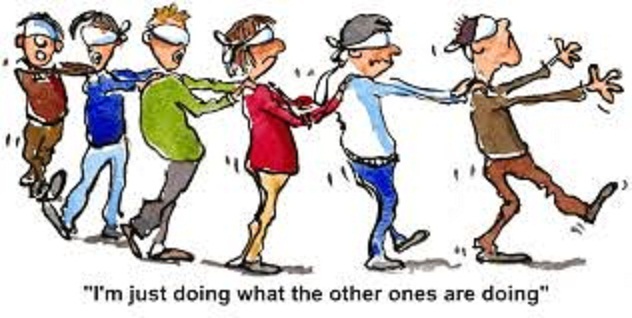 We just become a blind follower without analyzing what & why we are doing? WHICH CAN THINK AND ANALYSE. NEVER BECOME A BLIND FOLLOWER. JUST THINK BEFORE YOU ACT!! IT’S YOU AND ONLY YOU WHO CAN CREATE IT FOR YOUR LIFE!! This entry was posted in Life and tagged approach, Believe, blind follower, Formula, happiness, Life, opinion, philosopy, Quotes, Random, Thoughts, Values by Akanksha. Bookmark the permalink.